Ten years ago today, I published three posts on a new blog that I called Lines from Lee. I had no idea where it would lead me. So it’s fitting that I’m starting this post in the KLM Lounge at Schiphol Airport in Amsterdam, as I have a few minutes to grab a cup of coffee before my flight to Nairobi, Kenya. When I started my blog on July 30, 2006 my main purpose was to experiment with blogging and learn how to do it, in case we would ever want to have Mayo Clinic blogs. And while my more-than-full-time job was leading the Mayo Clinic media relations team, I found time for blogging at least in part because I thought it was amazing that I could publish to the world for free on wordpress.com. In my early days of blogging one of my major applications was to take notes during conference presentations. By live-blogging and linking to the speakers’ blogs or other online profiles, I reported what I was learning to a broader audience, and also shared my perspectives. And I began making connections. A major turning point was in late 2007, when I was asked to give a Facebook 101 presentation to the Association Forum of Chicagoland. Some in-depth questions led me to joke that they were asking for information that was more appropriate for a 200-level class. That’s what led me to rename my blog Social Media University, Global in January of 2008. And of course I gave myself the lofty title of Chancellor. My university name was a tongue-in-cheek riff on the geographic naming of many real universities in the U.S., such as UCLA, University of Alabama-Birmingham and University of Texas- Southwestern. Because my university was online and available anywhere in the world, the natural designation for Social Media University was…Global. Which made for a fun abbreviation. And when I developed and metaphorically nailed my 35 Theses to the wall of SMUG, it helped me to think through and make the arguments for why mid-career communications professionals need to develop capabilities with these new tools. 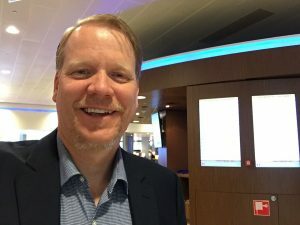 While I started seeing some traffic to SMUG from widespread locations, I never dreamed that it would lead to international travel and face-to-face connections. But in 2009, Lucien Engelen invited me to speak at a conference he was organizing at Radboud University Nijmegen in the Netherlands. I had only left the U.S. once previously, for a work-related trip to Calgary. Carolyn DerVartanian invited me to Sydney, Australia in 2011, and on some other trips I also got to visit Sweden, France (with a brief stop in London), Italy, and Mexico. More recently I’ve made a couple of trips to the United Arab Emirates and a return visit to Australia. 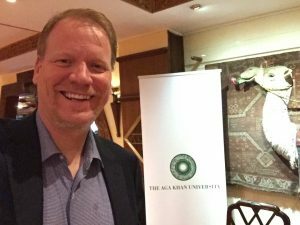 My two-week tour of China in June was amazing, and now I’m excited for my first trip to Africa, where I’ll be leading a workshop Monday at The Aga Khan University Hospital in Nairobi. 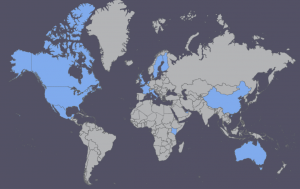 As best I can figure, I think I’ve presented in 39 states and Canadian provinces, too. Of course none of this would have happened if we hadn’t found good applications for social media at Mayo Clinic, and without the support of our leaders to have Mayo serve as a catalyst to help professional colleagues also venture into social media. Special thanks to Jim Hodge, Chris Gade, John LaForgia, Shirley Weis, Amy Davis, and our President and CEO, Dr. John Noseworthy, as well as Dr. Victor Montori and Dr. Farris Timimi, our former and current Medical Director for social media, and Dr. John Wald, our Medical Director for Public Affairs, for their backing and inspiration. 1. It all starts with taking the plunge. Gaining familiarity and comfort with blogging and social engagement personally made it much easier for me to confidently recommend Mayo’s involvement. 2. It’s not too late to start. When I began in 2006, I felt I was probably too late to the party. People like Robert Scoble, Jeff Jarvis, Shel Holtz, Shel Israel and Jeremiah Owyang had been blogging for a while, and I wished that I had recognized the opportunity sooner. Handwringing about starting late would have been not just unproductive; it would have been counterproductive. As the landscape has changed, you may want consider publishing on LinkedIn instead of having your own blog, to take advantage of LinkedIn’s distribution to professional connections. But it’s never too late to start expressing yourself thoughtfully online. 3. Geography doesn’t matter much. Social tools let you overcome barriers of time and space to bring together people with common interests. Even if there isn’t a dense concentration of those interested individuals in any one location, on the global scale enabled by social, there’s likely a large existing or potential community of interest. But that’s just a sign that social media are completely mainstream. Facebook suppresses organic reach for brands because it has so much friend content to show users, and because brands find Facebook advertising cost-effective in reaching their audiences. When I published my 35 Theses, Facebook was still almost three years away from its $100 billion IPO. Since then its market capitalization has more than tripled. And with most print and TV ads now including a hashtag or a Twitter handle, Thesis 12 is beyond dispute. 5. We have a great and generous online community in health care. The people I’ve come to know through this social media journey are delightful. Naming them all would completely blow my word count, so I’ll just highlight current and former members of our Mayo Clinic Social Media Network (#MCSMN) External Advisory Board, along with my team, a.k.a. the “Star Wars” team, and our #MCSMN Members and Platinum Fellows. It’s gratifying to have so many colleagues who want to learn together how we can best use social platforms for medical and health-related purposes. As I publish this now, having finished it during my Amsterdam-Nairobi flight and arrived at the Nairobi Serena Hotel, I’m filled with renewed thankfulness for another safe landing, and for a decade of blessings from blogging.